Sakai Guides and DocumentationSakai Complete User Guide AssignmentsHow do students submit an assignment? Click on the title of the assignment. Zoom: Click on the title of the assignment. You will a list of all assignments in the site. The following information will be displayed for each assignment. Assignment title, or name of the assignment. Status (i.e. Not Started, Assignment submission required, Returned, etc.). Open date when the assignment becomes available to students. Due date, or deadline to turn in the assignment. Select the assignment you want to submit by clicking on the title of the assignment in the list. Or, click the direct link to the assignment in Lessons. If your instructor has included a link to the assignment in the Lessons tool, you may also access it from this location within the course content. Enter and/or attach your assignment. Depending on the assignment settings, you may be allowed to enter your submission in-line and/or attach a file or files. 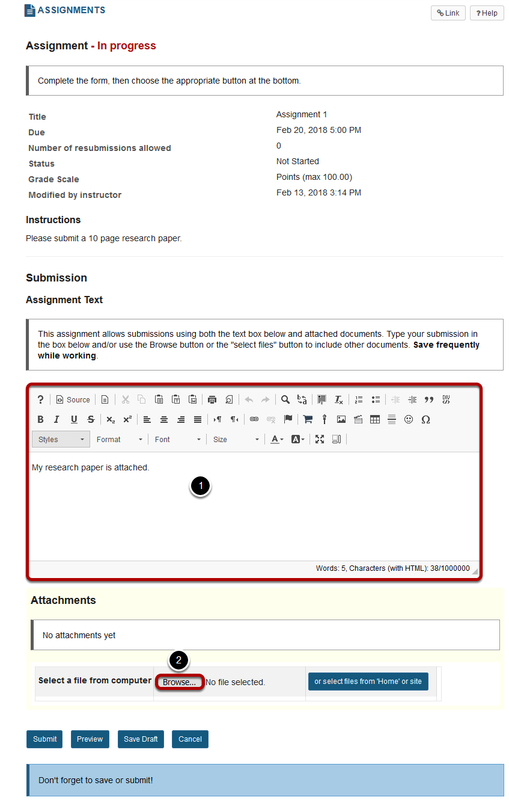 Enter your submission text into the Assignment Text area using the Rich Text Editor. Once you have attached your file, the name of the file, as well as the file size and upload time stamp will be displayed under Attachments. Tip: You may click Remove to remove the attachment if you selected the wrong file. When you are ready to turn in your assignment, click the Submit button to complete your assignment submission. Tip: If you are not yet ready to submit, you may click Preview to preview the submission, or Save Draft to save your submission and submit it later. Click Cancel to exit the assignment without saving or submitting. 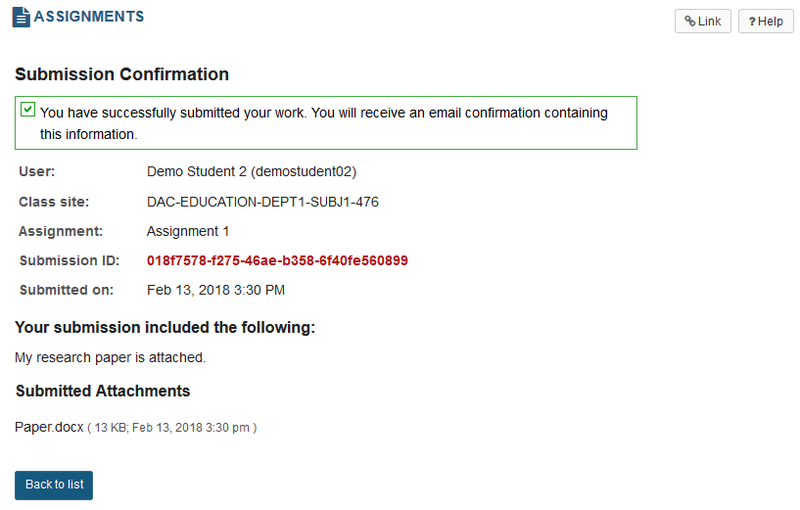 Once you have submitted your assignment, you will receive a confirmation message on screen. In addition, if you have opted to receive email notifications, you will also receive an email confirmation of your submission. Prev: How do I delete an assignment? Next: How do I submit an assignment on behalf of a student?